Approaching Dawn: The Witching Hour Review - A Spooky Good Time — GamingWithSwag.com - Dads By Day, Gamers By Night. Let's take a look at this one! 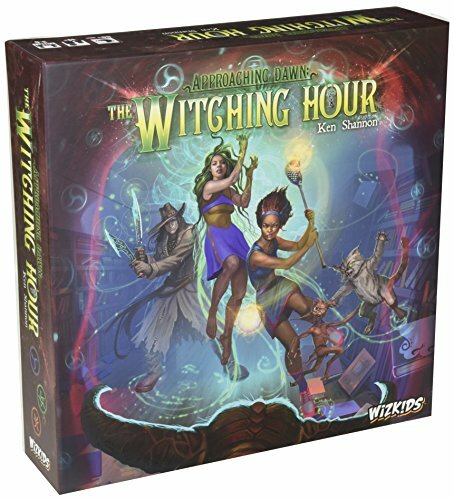 In The Witching Hour, players play as members of a witches coven who have used dark magic selfishly and are now paying the price by suffering a demon attack that lasts from midnight to dawn. The goal of the game is to last six rounds without any witch having 20 corruption points at the middle point or end of any round and without running out of cards from the 6 decks on the board. Each turn players take turns buying cards to add to their deck by taking corruption points. They then attract demons based on their corruption level. These demons eat some of the player corruption, getting rid of it, but if not dealt with by end of turn they'll cause more corruption and/or remove cards from the center decks. The main part of the game involves players secretly picking if they want to use the black or white magic side of the cards in their hand and then simultaneously playing them all. The black magic side is more powerful and can be used to defeat demons in front of you, but they give the player to your left corruption. The white magic side is weaker but it heals corruption and adds white magic to a communal pool that players use to banish other people's demons. Players only need to survive to the end of six turns but they all also have a unique secret with prerequisites they have to complete by end game or suffer a possibly game ending penalty. There are also different scenarios that change the rules a little bit which can change the gameplay. There's a lot going on here but the game runs pretty smoothly. It seems complicated till you play through a turn or two then it's easy as apple pie. Players each have a different character with a special ability so that, along with the different scenarios keeps the game from getting stale. This game also addresses an issue I have with co-ops where it just turns into the best player at puzzling things out making the decisions. During the phase where players decide which side of their cards to play, they are restricted from giving out any specific info. This really helps with the overbearing leader problem and adds some nice tension. I like the deck building aspect, but the cards are all pretty similar. After a few games I was still finding it hard to find a good strategy other then pick the best card. Your deck isn't completely unfocused but it's disappointing that the player's decks all seem similar at the end of the game. Great, well-written rules here. The designer includes a lot of examples and pictures of game play, there is a glossary, and multiple player aids/rules guides. The only gripe I have is that the rule book is physically too big! Listen publishers, just because your game has a large box, doesn't mean that the rule book needs to be the same size! It's a huge pet peeve of mine trying to look up a rule by flipping through a large unwieldy rule book! This is a home run. The Witching Hour conveys buckets of theme. The art evokes the feeling of being under attack by personal demons personified in real life, there is a nice little flavorful intro on all the scenario cards, and all the characters feel unique and different. Both groups I played this with joked about it being an unlicensed Charmed or Sabrina the Teenage Witch game. Setup and take down is much less of a hassle then in many deck builders due to the 6-different decks staying in separate piles throughout the game. If you put all the cubes in separate bags it makes it very easy. WizKids does an absolutely fantastic job with their components and this game is no exception. The player boards, scenario cards, and even player aids are printed on nice thick card stock and every piece of art is vibrant and full of life. The overall graphic design on the spell cards and the board really help set the tone of the game and do a good job cutting down any confusion. I liked this game and would gladly play it again if my friends wanted to play, but it's not going to be the first thing I go to if I'm in the mood for a co-op. This game is interesting, it looks great, and it's fun. The only problem is the deck building aspect doesn't seem fleshed out enough. I said it earlier but the game would have really benefited from more diverse card abilities. Because of this I really teetered between giving this game a Buy This Game and Buy it on Sale rating, but the fact that I'm still thinking about it days later pushes it over the edge. The only caveat to this being that if you're lukewarm on co-ops I'd stay away unless you get a good deal on it. Otherwise The Witching Hour is an exciting, flavorful game that shines in spite of a few flaws.